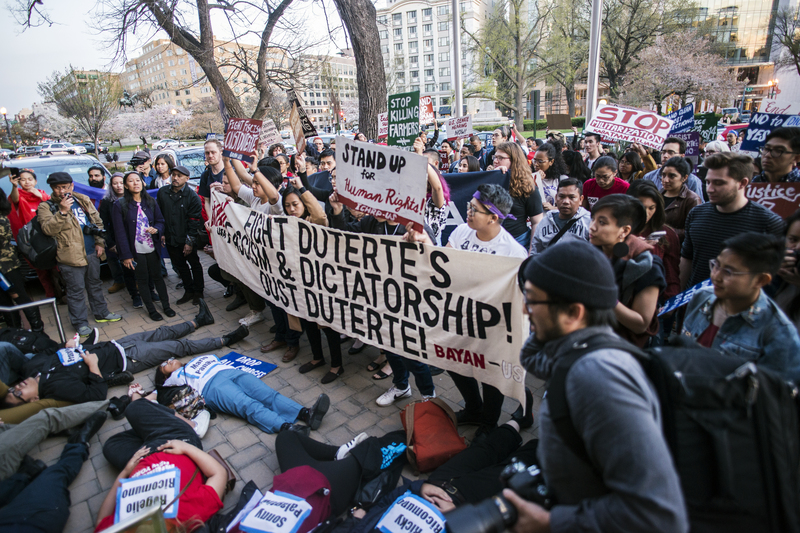 All around the US, Filipinos along with other groups who comprise the massive immigrant population in the US are fighting to change this country’s immigration policy, which currently facilitates the systemic exploitation, abuse, and repression of migrant workers. BAYAN-USA joins the May 1st marches across the country to stand up for migrant, immigrant and workers rights. We also endorse the principles and demands of the National Alliance of Filipino Concerns (NAFCON) for genuine comprehensive immigration reform to end deportations, unify and protect families, and end the modern day slavery of workers. The Senate immigration reform bill revolves around a so-called framework of four pillars purported by the Gang of 8 and endorsed by the Commander-in-Chief himself. It proceeds from the belief that migrants are a cheap source of exploitable labor on the one hand, and on the other hand a threat to the domestic security of the US and therefore must be heavily monitored, regulated, and subject to harsh law enforcement. The il-legalization of migrants is aligned with the US’s military and prison industrial complexes, which push the US economy to rely more and more on militarization and private prisons–including the growing immigrant prison industry– for sustenance. Despite President Obama’s outspoken push for comprehensive immigration reform, he has deported over 1.4 million immigrants in his first 42 months as president, much more than former President Bush and all previous American presidents, according to numbers provided by the Department of Homeland Security. The Senate bill also answers the demands of big business for flexibilization of the global labor market under the current economic crisis. This framework has resuscitated legal slavery and human trafficking in the US in order to reap the super-profits needed for US corporations to survive the current crisis. At present, this is already a function of the US guestworker program; the bill introduced by the Gang of 8 would expand guestworker programs even more, without strengthening worker protections. Instead, guestworker programs must be over-hauled to protect workers from discrimination and exploitation, provide for equal pay such as the prevailing wage in the industry, protect the right to unionize, and uphold the right to change employers and seek permanent residency or citizenship. The Senate bill also seeks to pit migrant workers against each other by stratifying immigrant categories based on education-level, skill-level, whether or not they are “well-meaning”, and how and when they arrived in the US. It is under such conditions that a draconian reform bill with racist underpinnings can be passed so swiftly and easily. We demand true immigration reform to provide real pathways to legalization for all current undocumented migrants living and working in the US, free of restrictions based on country of origin, economic status, education, or length of residency. In this era of neoliberalism, migration is not a choice, but a means to survive. US foreign economic policy is the biggest proponent of neoliberalism and forced migration one of its adverse social impacts. The U.S. government policies of war and exploitation – in the service of the 1% – fuel economic and social instability worldwide. Immigrants and migrants should not be blamed and scapegoated for our national security issues. Any just and pro-people legislation that is passed in the US can only be the result of a peoples struggle. The same applies to the immigration reform and the immigrant rights struggle in the US. Our demands for genuine immigration reform are linked to our struggle for a world where all people can thrive, families are not separated by the urgent need for survival, and our homelands have the conditions in which all people can live a decent and humane life. What was introduced by the Gang of 8 proves that genuine, fundamental change to the immigration system will not be won by relying on the goodwill of elected officials in Washington. As the Gang of 8’s bill gets debated and the House crafts its immigration reform bill, let us continue to build, strengthen, and unite the movement for immigrant rights to challenge repressive provisions and demand immigration reform that has the rights of immigrant families and workers at its heart. Our movement is the principal means of ensuring dignity, respect, and human rights for all immigrants in the US! BAYAN USA joins NAFCON and all migrants, immigrants, and workers on International Workers Day-May 1st rallies across the nation listed below! Join us in raising our voices against deportations and to call for workers rights across the board! 2pm Opening Rally at the Civic Center, 3rd & B St.
5:00 Closing Rally at Chicano Park, 1981 Logan Ave.
2:00PM @ 20th Ave. S and S. Jackson St.